Internet Explorer introduced tabs with version 7 but one of the many reasons I prefer Firefox and increasingly Chrome is that they handle tabs better. To open a new tab, you can hit the key combo Ctrl+T or click the button near the current tab in any of those browsers. The problem with Internet Explorer, both version 7 and 8, is that it takes a noticeable amount of time for the new tab to open even if it is just going to the about:blank page. The solution to make IE’s tabs open a bit more quickly is to disable a certain add-on, the Java(tm) Plug-In 2 SSV Helper. I’ve seen no ill effects to disabling this add-on and tabs seem to take half the time to open. To disable it, go to Tools, Manage Add-ons in the top-right corner. If you’re using IE7, (you should update to version 8) you will find it under Tools, Manage Add-ons, Enable or Disable Add-ons. 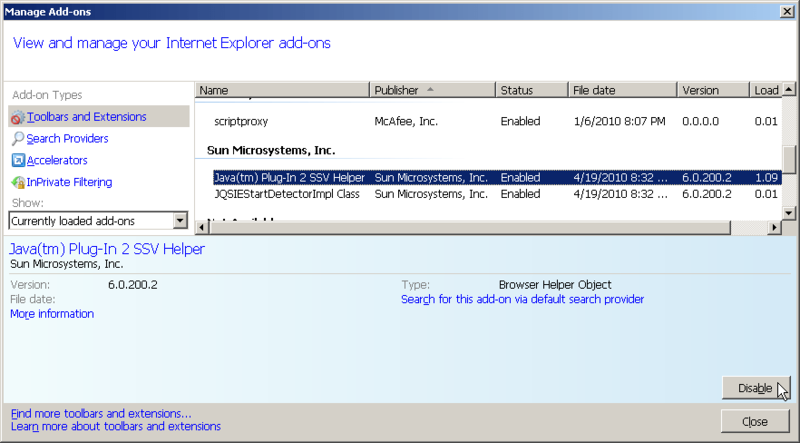 In the window that pops up, find the Java(TM) Plug-in 2 SSV Helper. Click on it and then hit the Disable button. Internet Explorer 7’s window looks a little different but it’s pretty straight-forward. You still select the add-on and then change the radio button from enable to disable. Close that window and restart Internet Explorer. You should now notice that tabs open faster (though still not as fast as Firefox or Chrome).